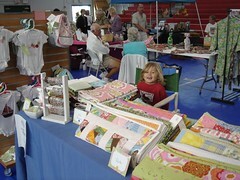 I participated in another craft show this weekend, this one at the school Cassie was attending. After last weekend my hopes weren't high ... but this one was much much much better. 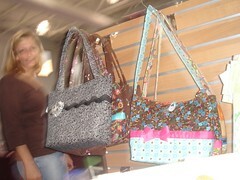 There were more vendors, more customers, and just more positive energy in the place. It was an indoor show ... good thing too, because the wind outside was insane. As you can see in the images, I had different helpers this weekend. A. and K. came along. It was a shorter show, just 4 hours, so I just hoped for the best from them. They were wonderful, perfect. They played with some toys I brought, then worked on some embroidery (A. handsewed a purse), while I sewed more onesies, and then they made a friend who they played with the rest of the time. I couldn't have asked for better behavior from them ... they played quietly, listened, and helped when I needed them to. Business was good, very steady. The top picture is me, standing next to the fixture I've been using for handbags and onesies (A. took the picture, forgive the blurriness ... I'm ok with it, it's camouflaging the wrinkles). I love that I can use faceouts on this rack to show these items, and I love that the rack has some height. But that rack weighs a ton and has a broken wheel, and after getting it into and out of the car one too many times I was thinking I needed to come up with something else, or just accept that I am now comfortable cursing like a sailor. Funny thing though ... as I was getting ready to take it out of the car at home it fell over and broke in a few places. It might still be useable, I haven't taken that good of a look at it, but I'm taking it as a sign that now's the time to find an alternative. No worries though ... if I don't think of a better solution I have four more of the same racks at Ditto Kiddo (dang!). 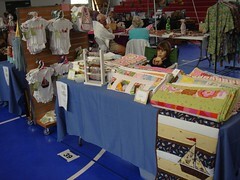 No more craft show talk, I promise. I don't have any more on the schedule right now. 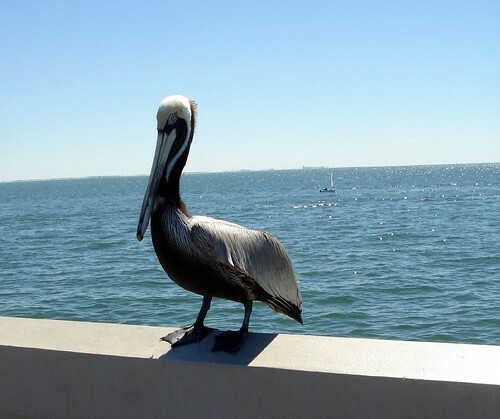 This fellow was up in St. Petersburg on the Pier, waiting to steal a fish from a busy fisherman. I'm not sure how successful he was, but he looks awfully confident, doesn't he? C. and M. were supposed to sail up in St. Pete this weekend. The strong winds took M. out of the regatta and C., and everyone else, just sailed on Sunday. Killing some time we traveled up to the Pier and took pictures of Bethany for the Monkey Travel Club flickr group (like I said, we were killing time!). We had a good time, laughing hysterically while lying on the sidewalk trying to get her to stand up. What about a coat rack? I use one sometimes to hang bags on. It's easy to transport and you can get one that's not too heavy. I'm glad you had a better show this week! Sometimes it's just the location that makes the difference!